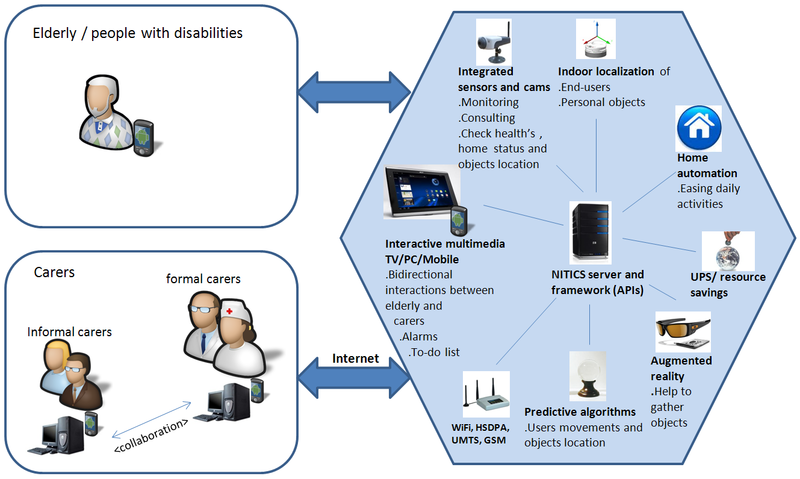 The NITICS project will build a flexible platform that will rely on a set of basic and task oriented services: localisation of personal objects (keys, glasses, mobile); localisation and movement pattern analysis of elderly and disabled people inside their homes – which, integrated with body sensors and environmental captors will support end-users as well as caregivers, family members, and others involved in assisting the person; a multimedia bi-directional platform (TV/PC/Smartphone) to ease, stimulate and support daily activities; augmented-reality system to assist users in finding the objects. NITICS will enable disabled persons to create, participate and continue their social activities not only via an Internet connection but also by using localisation technology inside their homes, supporting an active social life. The localisation technology is not only used to track and trace the assisted individual, nor just to gather objects’ and predict their position, but also to detect unpredictable or abnormal behaviour, lack of movement or erratic behaviour, and to trigger actions by care providers in case of need . Such a system will help carers to intervene only in case of need, in a timely manner and provide the needed help, taking into account the preferences of care providers as well as family and end-users. The NITICS framework will provide major benefits to the end-users but will also provide benefits to caretakers and people directly involved in the care value chain. The NITICS project designs and builds a holistic platform that is expandable and offers advanced ICT services including monitoring and navigational support for the mobility of elderly and disabled persons in their home during their daily activities. Furthermore, it also brings suitable services for elderly and people with diseases or disabilities (mobility handicaps, cognitive disabilities and mental diseases) that can keep their cognitive capability (at both physical and mental levels) intact. NITICS will provide a major impetus to the development of AAL types of services, by taking away many of the hurdles that developers are facing. Thus, NITICS-enabled services will have two major effects: on one hand it will improve the freedom and independence of the elderly, and on the other hand it will lead to cost savings when fully embedded in the health care system. Care costs can be reduced through the appropriate use of technology and hospital admissions can be delayed and even avoided.